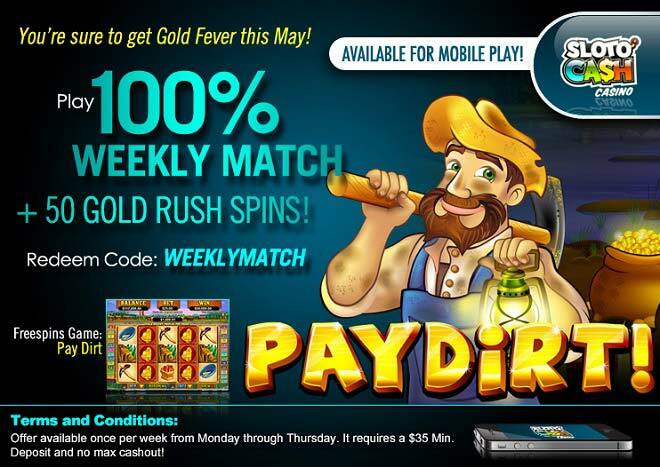 May is the perfect month to re-experience the Gold Fever days and search for golden wins with a $25 deposit that gives you a chance to play with a weekly 100% Match plus 75 Free Pay Dirt Spins! Traveling back in time has never felt as generous as this May when spinning the reels of Pay Dirt. The wild Gold Nugget symbol will multiply your wins this new month. But it’s the Scatter Pay Dirt icon that opens the doors to a bonus round game packed with free games and multipliers! May will become an era of golden wins for you when you deposit as little as $25 to play with a 100% Match and 50 Free Spins!